India is set to emerge as the diabetic capital of the world, as per the WHO estimates 31.7 million people were affected by diabetes mellitus (DM) in India in the year 2000. This figure is estimated to rise to 79.4 million by 2030, the largest number in any nation in the world. Almost two-third of all Type 2 DM and almost all Type 1 DM patients are expected to develop diabetic retinopathy (DR) over time.,,, The prevalence of developing any DR in patients with Type 1 diabetes was 56.0%, and 30.3% in Type 2 diabetes according to the UK National DR screening service. We retrospectively evaluated patients with DM who underwent 23-gauge pars plana vitrectomy (23G PPV) for PDR to study the effect of preoperative intravitreal bevacizumab (IVB) injection on the visual and anatomical outcome. This retrospective, comparative study was conducted in the vitreoretinal clinic at a Tertiary Care Teaching Hospital in North India. All patients with DM who underwent vitreoretinal surgery between January 2012 and January 2014 were identified from medical records and reviewed. All patients visiting the vitreoretinal clinic between January 2012 and January 2013 were placed in Group A (i.e. patients who had not received IVB), whereas patients who underwent surgery between January 2013 and January 2014 were placed in Group B (patients received IVB 1.25 mg in 0.05 ml 3 days preoperatively). Patients in both groups were matched as possible as according to the surgical indication and preoperative best-corrected visual acuity (BCVA). All patients who were included in the study were having metabolic and hypertension control and had undergone the following laboratory investigations: hemoglobin, glycosylated hemoglobin, fasting blood sugar, postprandial blood sugar, lipid profile, 24 h urinary protein, blood urea, and serum creatinine. Only those patients who underwent vitreoretinal surgery as a consequence of PDR were included in the study. 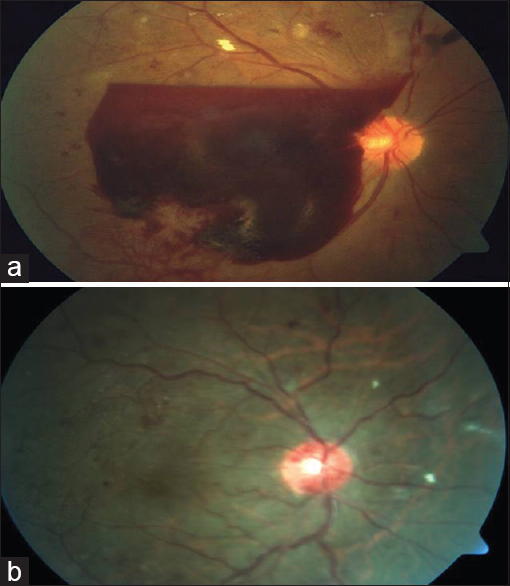 The indications for surgery included TRD threatening the macula, TRD with vitreous hemorrhage, nonclearing vitreous hemorrhage (NCVH) of at least 3-month duration, and massive retinal subhyaloid bleeding covering posterior pole [Figure 1]. All patients who had previously undergone vitreoretinal surgery, except laser surgery, or intraocular surgery of any type within the prior 6 months were excluded from the study. Patients who had previously received IVB were also excluded from the study. The following data were recorded from medical records: patient demographics, duration of diabetes, lens status, intraocular pressure, preoperative PRP, and BCVA and fundus biomicroscopy. Gonioscopy and ultrasonography (if fundus was not visible) was done in both the groups. All the patients included had data of postoperative examination at day 1, 7, 30, and thereafter monthly up to the end of follow-up to 12 months. The primary outcome assessed was visual and anatomical outcome where anatomical outcome means flat retina. The secondary outcomes assessed were intraoperative vitreous hemorrhage and early postoperative vitreous hemorrhage. TRD was defined as elevated retina visible or detected on ultrasound preoperatively or if that was a predominant pathology found at the time of operation. NCVH was defined as vitreous hemorrhage, which was persistent (for at least 3 months) or recurrent requiring surgery. A 10% povidone-iodine swabstick was then used to paint the injection site. Bevacizumab in dose of 1.25 mg in 0.05 ml was injected intravitreally 3.5 mm posterior to the superotemporal corneoscleral limbus through the pars plana in phakic patients, 3 mm away from the limbus in pseudophakic patients under complete sterile preparation in operation theater in usual sterile fashion using topical anesthesia. The surgical procedure was similar for both groups under local anesthesia. All patients underwent 23-gauge 3-port PPV by Feros Oertli vitrectomy unit by a single vitreoretinal surgeon. A binocular indirect ophthalmomicroscope (BIOM) was used in all cases, following sufficient clearance of the vitreous hemorrhage to allow visualization of the posterior pole when necessary; dissection of the preretinal fibrovascular proliferation was carried out. High-speed 23-gauge cutter (up to 2500 cuts/min) was used to cut membranes very close to the retina. With careful elevation of the posterior hyaloids by depressing the periphery with muscle hook, meticulous shaving of the vitreous base under a wide-angle viewing system (BIOM) was performed with careful attention to remove as much residual blood as possible. For macula, central Lander's lens was used to remove if any membrane at the macula. Fill-in pan retinal endolaser photocoagulation (PRP) was administered to any area of the previously untreated retina. Full attention was directed to relieving all traction. Hemostasis was maintained by raising intraocular pressure or by administering endolaser or endodiathermy. Intraoperative bleeding, any iatrogenic break, use of endodiathermy, and endotamponade used was documented. The decision to use endotamponade (either Air, C3F8 or Silicon Oil) was taken intra operatively. Criteria for silicone oil (a) intraoperatively found combined RD, (b) multiple iatrogenic breaks, (c) iatrogenic break in TRD, and (d) break near disc. Criteria for gas (a) in eyes with superior breaks with no proliferative vitroretinopathy, (b) inferior breaks with on or off the retina. At the end of surgery, single raw of cryotherapy is applied to the anterior retinal and around the sclerotomy sites in an attempt to quell fibrovascular in growth and subsequent hemorrhage. No internal limiting membrane peeling was done in any of the surgeries. Postoperatively, the following data were recorded: intraoperative complications, tamponade use, postoperative complications, vitreoretinal reoperations, and BCVA. Primary outcomes of this study were BCVA at 6 months, the incidence of intraoperative and postoperative complications, incidence of additional vitreoretinal surgery including the removal of silicon oil, and the restoration of useful vision to previously blind eyes. As shown in [Table 1]: A total of 200 eyes of 180 patients (106 male and 94 female) were included in this study. Median follow-up of the patients was 12 months. Cases of both groups were matched as possible as according to the surgical indication and preoperative BCVA [Table 1]. A total of 52 patients were male and 48 were female. History of the duration of diabetes was more than 15 years. Indication to do 23 GPPV was combined RD in 10% cases, TRD in 20% cases, VH and TRD were present in 30% cases, preretinal hemorrhage covering the macula in 20% cases, and dense VH in 20% cases. History of previous incomplete PRP was positive in 55% cases, and neovascularization of iris was present in 12% cases. A total of 54 patients were male and 46 were female. History of duration of diabetes was more than 16 years. Indication to do 23 GPPV was CRD in 12% cases, TRD in 25% cases, VH [Figure 2] and TRD were present in 25% cases, preretinal hemorrhage covering the macula in 20% cases, and dense VH in 18% cases [Figure 3]. History of previous incomplete PRP was positive in 60% cases, and neovascularization of iris was present in 15% cases. 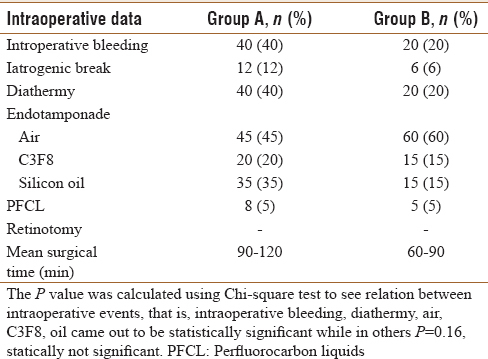 As shown in [Table 2]: Intraoperative bleeding was noted in 40%. Iatrogenic break occurred in 12% of cases with extensive TRD. In all cases of intraoperative bleeding, diathermy was used to stop the bleeders. A total of 35% received silicone oil in the primary vitrectomy, C3F8 was used in only 20 % cases and air was used in 45%. PFCL was used to flatten the retina in 8 cases. The mean surgical time taken from draping to patching was calculated, and it was around 90–120 min. After receiving IVB 3 days back, patients noticed mild-to-moderate improvement in their previous BCVA. No injection-related complication was noticed. On the 4th day, patients were taken for the surgery after metabolic control. Intraoperative bleeding occurred in 20% cases, and we noticed easy clearing of the VH and ease in membrane peeling in cases of TRD. The iatrogenic break occurred in six cases. Diathermy was used in all cases with intraoperative bleeding. PFCL was used in 5% cases. Regarding intraoperative tamponade, silicone oil was used in 25% cases with all combined RD, extensive TRD, multiple breaks, and two one patients for early visual recovery. C3F8 was used in 15% cases; air was used in 60%. The mean surgical time was 60–90 min in this group. As shown in [Table 3]: Anatomical attachment was noted in 65% cases; five cases had redetachment due to reproliferation so silicon oil removal + RePPV + ReSOI was done after the second surgery anatomical attachment received in 70% cases. Early VH noted in 30%, and late VH noted 15%. 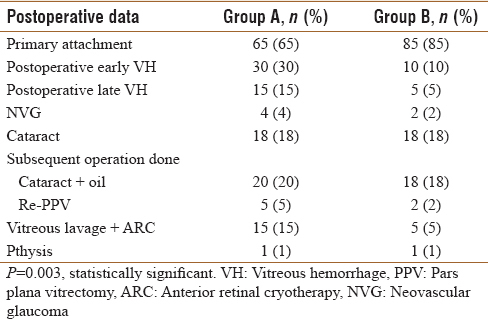 Dispersed VH (unresolved) 15% were taken for vitreous lavage, and anterior retinal cryotherapy (ARC) and IVB was given. Progression of cataract was noticed in 18%, in these cases cataract surgery with silicone oil removal done as combined procedure. Four cases developed neovascular glaucoma (NVG) were also given IVB where media was not clear but where media allows fill-in PRP was done. Reoperations were done in 40% cases. Final visual acuity showed improvement in 65% cases and approximately 35% of patients achieve vision of 20/80 or better. Four eyes developed NVG. One eye underwent phthisis because of repeated surgeries. Anatomical attachment was noted in 85% cases. Early VH noted in ten cases and late VH were noted five cases. Hence, the incidence of postoperative VH was seen in only 15% cases which are half of Group A. In 10 cases, it resolved over a period of month. Dispersed VH (unresolved) only in 5 cases which were taken for vitreous lavage and ARC and repeat intravitreal Avastin was given. In this group, cataract surgery with IOL implantation with silicone oil removal was done in 18 cases after 6 months. NVI which present in 15 cases preinjection of bevacizumab regressed in 13 cases preventing progression to NVG, only two patient developed NVG. Significant visual improvement occurred in IVB with the final visual acuity showing improvement in 78 cases; approximately 48% of patients achieve vision of 20/80 or better. Reoperations were done in 25% cases. One eye landed up in phthisis. In this retrospective study, IVB plus microincision vitrectomy surgery (MIVS) offered success in visual and anatomic outcome in patients with TRD in advanced PDR. This technique shortened the surgical time minimizing intraoperative complications and gave favorable visual outcome. It has been shown IVB plus MIVS offered a comparable anatomic success compared with conventional 20-gauge PPV in patients with TRD resulting from severe PDR. This technique shortened the surgical time with fewer intraoperative complications and favorable visual recovery. In Group B, patients had received IVB, bevacizumab injections are given at day 0 and patient is taken for the surgery on the 3rd day is considered to be the optimum time for vascular regression. In the present study, intraoperative hemorrhage was noted in 40% cases of Group A and in 20% in Group B. In Group B, there was marked reduction in intraoperative bleed thus minimizing the use of endodiathermy and facilitating complete removal of membranes which further increases the visual outcome. It has been reported that the removal of hemorrhage not only extends preexisting retinal break but also may create new retinal breaks; therefore, hemorrhage should be avoided whenever possible. The mean surgical time was reduced from 90 min to 60 min in patients given IVB which was due to reduced intraoperative bleed, better visualization, easier peeling of membranes, less use of endodiathermy, and MIVS system. In a study, after preoperative injection of bevacizumab, there was reduction in surgical time as well as reduction in frequency of intraoperative use of endodiathermy. In our study, the prevalence of postoperative VH was lower than that reported in other studies which could be explained by the use of IVB on 3rd day preoperatively.,,,,,, It usually clears in 50% cases within a month as shown by another study, there is a trend to reduced incidence of early postvitrectomy hemorrhage in patients undergoing vitrectomy for complications of PDR that have been pre-treated with IVB 1 week before surgery. In another study, IVB was found effective in cases with VH secondary to PDR in terms of reducing the need for surgery and increasing the rate of subjects to who PRP could be applied in the early period, although there was no impact on final visual acuity. Preoperative IVB was helpful in achieving the surgical and anatomical goals by reducing the time of surgery, the intraoperative and postoperative bleeding, and the use of silicone oil with subsequent reduction of second surgery. Significant visual improvement occurred in IVB with the final visual acuity showing improvement in 38 cases, approximately 20% of patients achieve vision of at least 20/40. In DR vitrectomy study, patients with active proliferation and good vision preoperatively attained vision of 20/40 or better in 41% eyes postoperatively. In our study, in Group A, final visual acuity showed improvement in 65% cases and approximately 35% of patients achieve vision of 20/80 or better. Significant visual improvement occurred in IVB with final visual acuity showing improvement in 78 cases; approximately 48% of patients achieve vision of 20/80 or better [Table 3], [Table 4], [Table 5]. A major drawback in this comparative series is its retrospective nature and the fact that the comparison group was nonrandomized which might generate bias and allow confounding factors to mask the true effect of IVB injections in facilitating surgery and limiting postvitrectomy hemorrhage and complications. In the era of MIVS, anti-VEGF therapy plays an effective role in minimizing complications and giving the patient better visual and anatomical outcome. In developing countries like India, bevacizumab being cheap can contribute in reducing postoperative complications in advanced PDR. Prevention of Blindness from Diabetic Retinopathy. Report of a WHO Consultation. Geneva, Switzerland; 9-11 November, 2005. Available from: http://www.who.int/blindness/Prevention%20of%20Blindness%20from%20Diabetes%20Mellitus-with-cover-small.pdf. [Last accessed on 2017 May 22]. Guidelines for the Comprehensive Management of Diabetic Retinopathy in India. VISION 2020: The Right to Sight INDIA Publication; July, 2008. Available from: https://www.iapb.org/sites/iapb.org/files/Guidelines%20for%20th e%20Comprehensive%20Management%20of%20DR%20in%20India.pdf. [Last accessed on 2017 May 22]. Thomas RL, Dunstan FD, Luzio SD, Chowdhury SR, North RV, Hale SL, et al. Prevalence of diabetic retinopathy within a national diabetic retinopathy screening service. Br J Ophthalmol 2015;99:64-8. Blankenship GW. Stability of pars plana vitrectomy results for diabetic retinopathy complications. A comparison of five-year and six-month postvitrectomy findings. Arch Ophthalmol 1981;99:1009-12. Blankenship GW, Machemer R. Long-term diabetic vitrectomy results. Report of 10 year follow-up. Ophthalmology 1985;92:503-6. Yang CM. Surgical treatment for diabetic retinopathy: 5-year experience. J Formos Med Assoc 1998;97:477-84. West JF, Gregor ZJ. Fibrovascular ingrowth and recurrent haemorrhage following diabetic vitrectomy. Br J Ophthalmol 2000;84:822-5. Novak MA, Rice TA, Michels RG, Auer C. Vitreous hemorrhage after vitrectomy for diabetic retinopathy. Ophthalmology 1984;91:1485-9. McLeod D. Microsurgical management of neovascularisation secondary to posterior segment ischaemia. Eye (Lond) 1991;5(Pt 2):252-9. Tolentino FI, Cajita VN, Gancayco T, Skates S. Vitreous hemorrhage after closed vitrectomy for proliferative diabetic retinopathy. Ophthalmology 1989;96:1495-500. Manzano RP, Peyman GA, Khan P, Kivilcim M. Testing intravitreal toxicity of bevacizumab (Avastin). Retina 2006;26:257-61. Spaide RF, Fisher YL. Intravitreal bevacizumab (Avastin) treatment of proliferative diabetic retinopathy complicated by vitreous hemorrhage. Retina 2006;26:275-8. Avery RL. Regression of retinal and iris neovascularization after intravitreal bevacizumab (Avastin) treatment. Retina 2006;26:352-4. Chen E, Park CH. Use of intravitreal bevacizumab as a preoperative adjunct for tractional retinal detachment repair in severe proliferative diabetic retinopathy. Retina 2006;26:699-700. 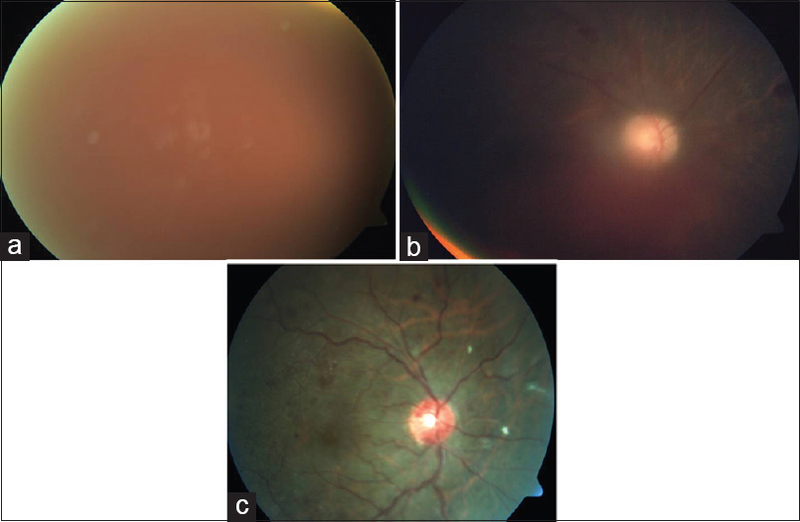 Oshima Y, Sakaguchi H, Gomi F, Tano Y. Regression of iris neovascularization after intravitreal injection of bevacizumab in patients with proliferative diabetic retinopathy. Am J Ophthalmol 2006;142:155-8. Aiello LP, Brucker AJ, Chang S, Cunningham ET Jr., D'Amico DJ, Flynn HW Jr., et al. Evolving guidelines for intravitreous injections. Retina 2004;24:S3-19. Oshima Y, Shima C, Wakabayashi T, Kusaka S, Shiraga F, Ohji M, et al. Microincision vitrectomy surgery and intravitreal bevacizumab as a surgical adjunct to treat diabetic traction retinal detachment. Ophthalmology 2009;116:927-38.
di Lauro R, De Ruggiero P, di Lauro R, di Lauro MT, Romano MR. Intravitreal bevacizumab for surgical treatment of severe proliferative diabetic retinopathy. Graefes Arch Clin Exp Ophthalmol 2010;248:785-91. Lee MS, Abrams GW. Membrane dissection in proliferative diabeticretinopathy. In: Peyman GA, Ameffert S, Conway MD, editors. Vitreoretinal Surgical Techniques. London: Martin Dunitz Ltd.; 2001. p. 251-66. Rizzo S, Genosi-Ebert F, Di Bartolo E. Injection of intravitreal Avastin before vitrectomy surgery in the treatment of proliferative diabetic retinopathy [abstract]. Program and Abstracts of “Cannes Retina Festival”: The Joint Meeting of the American Society of Retina Specialists and European Vitreoretinal Society; 9-13 September, 2007; p. 140. Summanen P. Neovascular glaucoma following vitrectomy for diabetic eye disease. Acta Ophthalmol (Copenh) 1988;66:110-6. Oldendoerp J, Spitznas M. Factors influencing the results of vitreous surgery in diabetic retinopathy. I. Iris rubeosis and/or active neovascularization at the fundus. Graefes Arch Clin Exp Ophthalmol 1989;227:1-8. Sima P, Zoran T. Long-term results of vitreous surgery for proliferative diabetic retinopathy. Doc Ophthalmol 1994;87:223-32. Benson WE, Brown GC, Tasman W, McNamara JA. 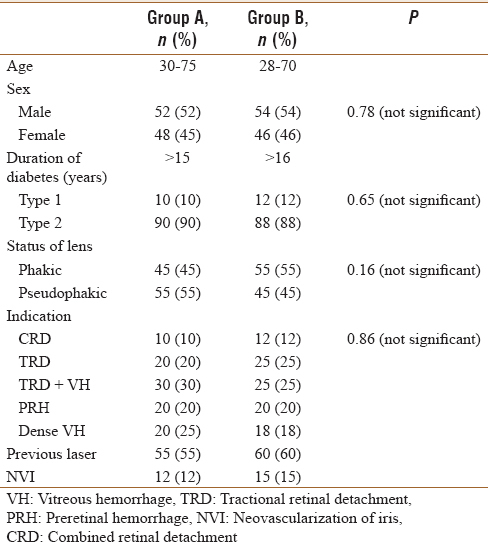 Complications of vitrectomy for non-clearing vitreous hemorrhage in diabetic patients. Ophthalmic Surg 1988;19:862-4. Blankenship GW. Management of vitreous cavity hemorrhage following pars plana vitrectomy for diabetic retinopathy. Ophthalmology 1986;93:39-44. Liggett PE, Lean JS, Barlow WE, Ryan SJ. 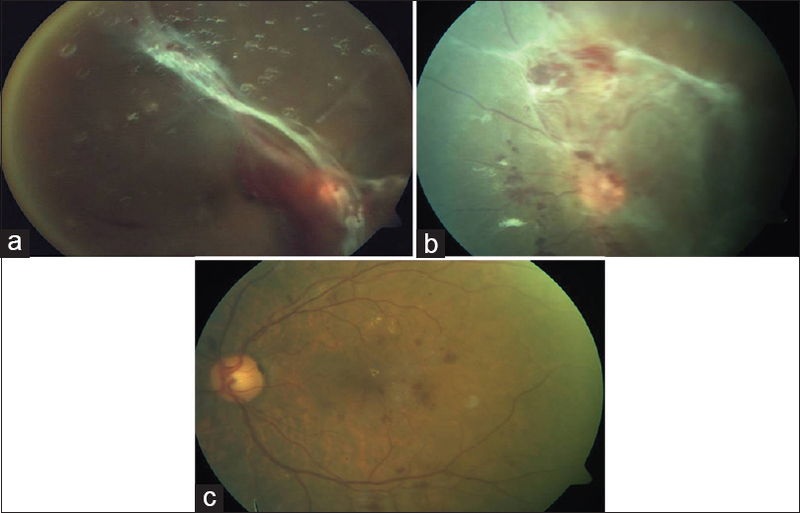 Intraoperative argon endophotocoagulation for recurrent vitreous hemorrhage after vitrectomy for diabetic retinopathy. Am J Ophthalmol 1987;103:146-9. Virata SR, Kylstra JA. Postoperative complications following vitrectomy for proliferative diabetic retinopathy with sew-on and noncontact wide-angle viewing lenses. Ophthalmic Surg Lasers 2001;32:193-7. Yorston D, Wickham L, Benson S, Bunce C, Sheard R, Charteris D, et al. Predictive clinical features and outcomes of vitrectomy for proliferative diabetic retinopathy. Br J Ophthalmol 2008;92:365-8. Al-Kharashi A, Galbinur T, Mandelcorn ED, Muni RH, Nabavi M, Kertes PJ, et al. The adjunctive use of pre-operative intravitreal bevacizumab in the setting of proliferative diabetic retinopathy. Saudi J Ophthalmol 2016;30:217-20. Alagöz C, Yıldırım Y, Kocamaz M, Baz Ö, Çiçek U, Çelik B, et al. The efficacy of intravitreal bevacizumab in vitreous hemorrhage of diabetic subjects. Turk J Ophthalmol 2016;46:221-5. Meredith TA. Current indications for diabetic vitrectomy. In: Lewis H, Ryan SJ, editors. Medical and Surgical Retina: Advances, Controversies and Management. St. Louis: Mosby; 1994. p. 290-303. Early vitrectomy for severe proliferative diabetic retinopathy in eyes with useful vision. Results of a randomized trial – Diabetic retinopathy vitrectomy study report 3. The diabetic retinopathy vitrectomy study research group. Ophthalmology 1988;95:1307-20.